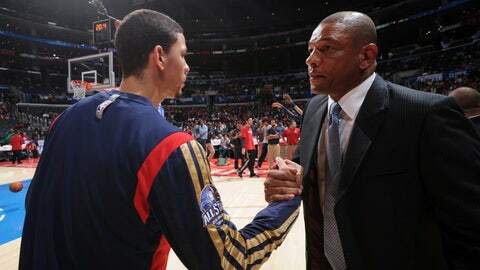 Austin Rivers (left) scored two points in the Clippers' win over the Pelicans, but his dad, Los Angeles head coach Doc Rivers, had no interest in postgame gloating. LOS ANGELES – The subplot to the Clippers’ game Wednesday night against the New Orleans Pelicans was personal for Doc Rivers. If he thought it might be fun to coach against his son, he has since found out it’s no fun at all. In some ways, it’s a bit painful. Austin Rivers scored two points in the Clippers’ 108-95 win over the Pelicans at Staples Center, but his dad had no interest in postgame gloating. Beating the Pelicans was one thing; beating his son was quite another. The Clippers won for the fifth time in six games and got another exceptional defense performance, holding the Pelicans to 39.8-percent shooting. But the matchup between father and son was nothing to brag about. Three days after scoring a season-high 17 points at Denver, Austin Rivers, a second-year player from Duke, made just one of four shots in 14 minutes 35 seconds. Playing in a game against his father’s team no longer puts him on edge, Rivers said. “Maybe last year, my first game, but I’ve gotten more comfortable with it now,” he said. “I don’t even think about it anymore. But it’s not so easy for Doc Rivers. He wants his son to perform well, but his job is to win games – and if that means beating him, he’s willing to do that. His wife, Kris, stayed home and watched the game on TV, Rivers said. He understood completely. There wasn’t much to cheer. The Clippers, perhaps still feeling the effects of their seven-game road trip, took the lead after the first two minutes but never quite put away the Pelicans. 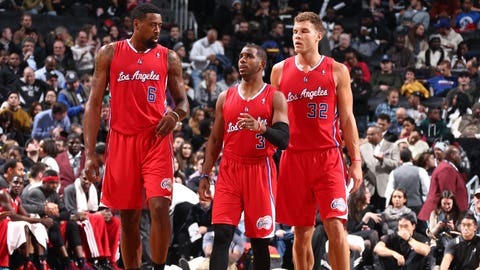 Blake Griffin scored 21 points, DeAndre Jordan had 14 and 20 rebounds, and Chris Paul had 12 points and 11 assists. Anthony Davis scored 24 points for the Pelicans, and Tyreke Evans finished with a triple-double: 11 points, 13 rebounds and 10 assists off the bench. Doc Rivers seemed content just to get the game out of the way. There was no embrace after the game, and although Rivers talked about having a postgame dinner with his son, Austin shook his head when he was asked if they would meet later. Winning was fine. Beating his son wasn’t. When he’s on the floor, it’s your son. But I want to beat him. I know what side my family is on.